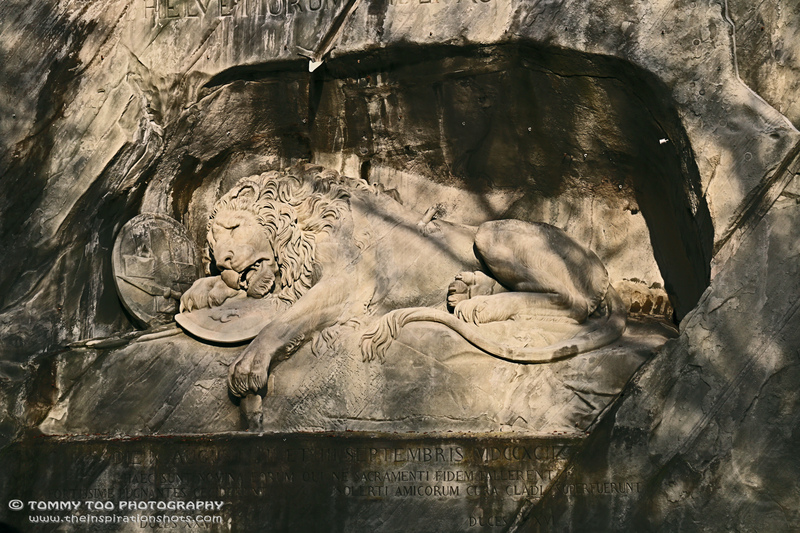 The Lion Monument in Lucerne is a giant dying lion carved out of a wall of sandstone rock above a pond at the east end of the medieval town. It was designed as a memorial for the mercenary soldiers from central Switzerland who lost their lives while serving the French king Louis XVI during the French Revolution. When the revolutionary masses attacked the royal Tuileries castle in Paris on August 10, 1792 the Swiss mercenary troops tried to defend the royal family and make sure the royals could escape. An officer of the Swiss guards, second lieutenant Carl Pfyffer von Altishofen, a descendant from an influential patrician family, happened to be on home leave in Lucerne when his fellow soldiers were killed in Paris. After the times of revolution were over in 1815 and France as well as Switzerland had returned to conservative regimes, Pfyffer felt obliged to erect a memorial to honor the mercenary soldiers. Liberal politicians from all over Switzerland disapproved of the memorial, but they were in a minority position during the 1820’s and Pfyffer was backed by a majority in Lucerne. The Lion Monument was inaugurated on August 10, 1821. The Lion Monument was designed by Bertel Thorvaldsen (1770-1884), a classicist Danish sculptor in 1819 while he stayed in Rome, Italy. Lucas Ahorn (1789-1856), a stone-mason from Constance (southern Germany) actually carved it out of the sandstone rock in 1820/1821. The giant sculpture is 6 m [20 ft] high and 10 m [33 ft] long. The upright wall of rock is the remains of a quarry exploited over centuries to build the town.